This model is valid CellML but can not be integrated as it is overconstrained. Some variables are not initialised but more importantly the model contains time delays, making it unsuitable for description using CellML. finally, viral loads continue to decrease, but at a slower rate. In the Dixit and Perelson 2004 publication described here, the authors present a mathematical model that combines pharmacokinetics and viral dynamics and includes intracellular delay. The model of viral dynamics is based on that published by Perelson et al. (see the figure below). To accurately represent the pharmacokinetics they assume a two compartment model consisting of blood and cells. The models of viral dynamics and pharmacokinetics are connected via a parameter which represents drug specific efficacy. Because reverse transcriptase inhibitors (RTIs) and protease inhibitors (PIs) have very different effects on the duration of the intracellular delay, they have been modelled separately (see and ). 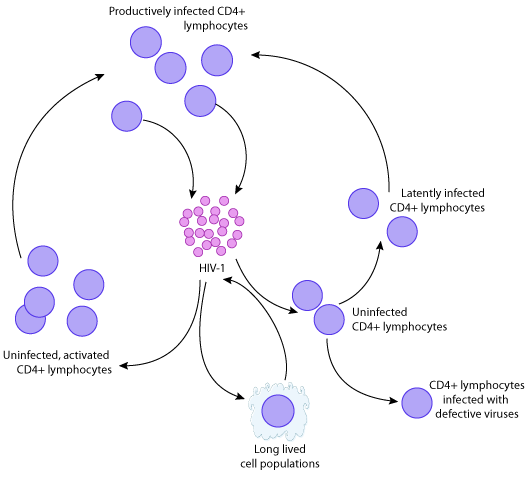 Schematic summary of the dynamics of HIV-1 infection in vivo. This model is based on that published by Perelson et al. in 1996. Pharmacokinetics - the two compartment model for protease inhibitors. Pharmacokinetics - the two compartment model for reverse transcriptase inhibitors. The main difference between the models is that RTIs must be phosphorylated within the cell in order to be in their active form. Derived from workspace Dixit, Perelson, 2004 at changeset ca90068e1ced.